Scotland ~ Fife, a photo by e r j k p r u n c z y k on Flickr. 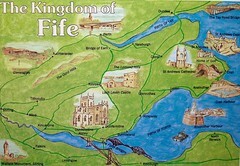 Fife is a bonnie part of Scotland, but obviously when it’s called the Kingdom of Fife it’s just a way to commemorate the fact that it was a Pictish kingdom many centuries ago. The word “kingdom” thus has a ceremonial meaning in the collocation “Kingdom of Fife”, but a real, current meaning when we say “the United Kingdom of Great Britain and Northern Ireland”. The reason for this brief introduction to the meanings of the word “kingdom” is that I wonder whether something similar is true with regard to Scotland’s status as a country. Most Scots — and definitely everybody on the Yes side — see Scotland as a real country, which just happens to have formed a political union with England, Wales and Northern Ireland. However, I wonder whether some people on the No side mean something completely different when they say that Scotland is their country, for instance when they insist that they love their country just as much as the Yes campaigners. Do they interpret “country” in a ceremonial fashion, just like the meaning “kingdom” has in the “Kingdom of Fife”? So do they actually mean that they love their region (Scotland), presumably as part of a real country (i.e., the UK)? This is important because it relates to the representation Scotland gets in Westminster. If you’re claiming “my country” as being Scotland, then it’s a country [that] only gets the government its people vote for around 40% of the time. The argument from the No camp is that Scots have a vote in electing UK governments like everyone else does, and should just shut up and accept it if their wishes get over-ruled by the much larger population of England, because that’s democracy and people in Newcastle get Tory governments they didn’t vote for either. But that only works if you’re saying that your “country” is the UK. The minute you identify Scotland as being a country in its own right, that argument disintegrates. Regions of a country have to accept the overall will. Countries should get the governments they vote for. In other words, if Scotland is a country, then the UK is a union and Scotland should get many more seats in the House of Commons. It’s also logical that Scotland has a parliament, a separate legal system and even its own football team. However, if Scotland is just a region which is ceremonially called a country, then the current representation in the House of Commons is completely fair, but it’s then a bit strange why Scotland needs a parliament when other regions don’t (in this world view, four regions have parliaments — Scotland, Northern Ireland, Wales and London — but eight don’t: NE England, NW England, Yorkshire and The Humber, East Midlands, West Midlands, East of England, SE England and SW England), and there’s absolutely no justification for Scotland having a separate legal system and its own football team. I’d like people from the No campaign to tell me what kind of country they consider Scotland to be. My country is the UK. Scotland is only ceremoniously called a country because Scots get upset if you call it otherwise. Blind patriotism can’t be convinced. The problem with arguing your beliefs is that you can never win and don’t know when you’ve lost. I’m not suffering from blind patriotism — I’m Danish for crying out loud! Anyway, don’t you agree that if a majority of people in Scotland consider Scotland to be a country inside a union (the UK), and this view isn’t shared by most people in the rUK, then the best solution would be independence? Well no. Just because people consider it something doesn’t mean it is. Most Americans consider America to be the greatest country in the world, doesn’t make it so. We have no passport, our government answers to another, we have no embassies, we don’t control our exports and imports, ours laws are not independent, we don’t have our own currency. We are a region within a country. Yes, from an international perspective, Scotland was extinguished in 1707 — it ceased to exist except as an internal division of Great Britain (and later the UK). However, as I was saying, a very large number of Scots consider the UK to be a union of countries, and given that this world-view conflicts with the international view, surely a neat solution would be independence and in that way bring the international view into line with the domestic one. I am not a Scot, but those I know speak proudly of Scotland as a country, not a region, and the meddlings of politicians over the centuries will never change that. Eileen BK. This is a rediculous question. Scotland is a country. There is no if or but. Just as England is a country. We do not think of the UK or France as a region just because they joined the European union. The UK was formed as a union of countrys just as the EU was formed as a union of countrys. Did you fail geography?